Nancy Stordahl lost her mother to breast cancer in 2008. Two years later she too was diagnosed with breast cancer. Her blog Nancy’s Point tries to make sense out of these life-altering situations by sharing her personal experience, advice, and thought-provoking commentary. With precision and gentle humor, Nancy has written about treatment, survivorship, grief, loss, and some of the real concerns she has about current forms of breast cancer awareness and advocacy. With permission, Pink Ribbon Blues republishes an edited version of Nancy Stordahl’s recent essay “Are We Really Racing for a Cure?” which was originally posted on Nancy’s Point on May 12, 2011. Sunday, May 8th was Mother’s Day. It was also the day of one of the Susan G. Komen Race for the Cure events, which was held at the Mall of America in Bloomington, MN. I live close to the Twin Cities and lived there for many years, hence my interest. News clips about the special Mother’s Day event captured yet another sea of pink, another shining example of the success of the pink ribbon campaigns. While watching the news that night, I observed the anchors beaming as they told viewers about how the event drew 55,000 walkers, a new record, and raised 2.5 million dollars for Susan G. Komen for the Cure. The anchors proudly stated that this particular race had grown to be the second largest race of its kind in the world. The message was warm and fuzzy. “Such a nice event and for such a worthy cause,” they repeatedly said while nodding and smiling at each other. As the coverage continued, I found myself feeling fidgety, uncomfortable and yes, even guilty because I was not feeling what I was supposed to be feeling. In fact, I was feeling the exact opposite. The story was meant to be the kind that makes people feel good. It was a Sunday evening following a perfect spring day. And it was not just any Sunday evening but Mother’s Day Sunday evening. The whole story evoked strong emotions about mothers, family, and the goodness of getting outside to do something for a worthy cause. I had to ask myself why this kind of event makes me and many others feel so uncomfortable? Why does it make me feel like I am a “bad/ungrateful cancer survivor” for not feeling a debt of gratitude to the “wonderful” organization behind this glamorized pink event? I concluded that part of my discomfort stemmed from the fact that all of this walking/racing, all of this pink, all of this feel-good effort in the name of breast cancer has done little to change the facts about the breast cancer epidemic. According to the National Cancer Institute (NCI) the incidence of breast cancer has fluctuated over the years with a general upward trend. Most recently, there was a drop in incidence due to reductions in the use of Hormone Replacement Therapy, but the incidence of breast cancer did not continue to go down after that. The chance of a woman developing breast cancer in her lifetime has increased from about 1 in 11 in 1975, to 1 in 8 today. Despite all the fundraising there is little focus in the pink mainstream on finding out why. In addition to scary rates of incidence, the number of deaths occurring daily from breast cancer has not significantly decreased. NCI data shows that on average the number of deaths per day declined from 119 in 1991 to 110 in 2010. At this rate, it would take a very long time to reduce mortality due to breast cancer. Presently there is little knowledge about how to determine which breast cancers will spread and which will not. Even people diagnosed at lower stages can get metastatic breast cancer (MBC), and MBC continues to be lethal (responsible for at least 90% of breast cancer deaths). MBC is the great unknown, yet only a fraction of research dollars are spent researching metastatic cancers. It’s estimated that roughly 155,000 women in the United States are living with metastatic disease, but no one knows for sure because even this statistic is not tracked accurately. Other estimates put the number to more than 250,000. Note: There is more information about the current state of the breast cancer epidemic in a white paper from the National Breast Cancer Coalition. The lack of attention to metastatic breast cancer really boggles my mind, because it’s not the primary tumor in a woman’s or man’s breast that kills; metastatic breast cancer does. Yet somehow this connection is missed. Those who are most frequently interviewed at breast cancer events like the Komen race have known someone or lost a loved one to breast cancer. Many of us have. But this means the person they lost probably died from metastatic (stage IV) breast cancer. Why is this connection ignored? Why don’t people talk about it? Metastatic breast cancer doesn’t fit in nicely with the prettier, pinker, happier, victorious side of breast cancer campaigns. Instead the primary focus continues to be on raising money while spreading messages about how we’re making so much progress thanks to early detection. What I don’t understand is that if so many breast cancers are found early, why isn’t there a reduction in late stage disease? Why isn’t it early enough to prevent recurrence? The message is almost always that if you find your cancer early, you will be cured. Unfortunately, this is not always the case. Early detection does not necessarily equal cure, and it certainly doesn’t equal prevention. I’m not saying it isn’t good to find cancer as early as possible, but awareness and early detection are not the end of the story. Still, we don’t seem to be willing or able to move beyond the simple message. Not only are simple awareness/fundraising campaigns like the Komen race easier and prettier for some people to deal with, they are way more profitable for companies and for Komen. It’s no coincidence that the Mother’s Day race was held at the Mall of America. What a smart and effective marketing and public relations strategy! 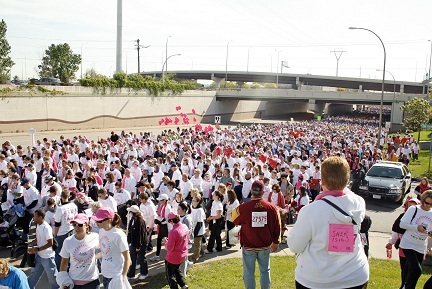 Race participants could race for the cure and then go shopping “for the cure” afterwards. How much money was made that day? Is this how the success of breast cancer awareness should be measured? Not in my eyes. I’m more interested in how much of that money ends up in innovative research; how many lives are really saved; whether it will move us any closer to understanding what’s causing this disease. So while I am glad that Komen sends some of its revenues toward research (approximately 20%), I am NOT satisfied. I am NOT warm and fuzzy. I am NOT grateful for the fun-loving distraction from the realities of this disease. 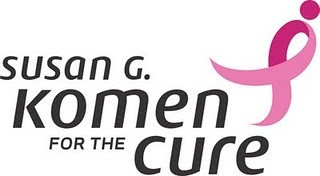 The Race For the Cure is Komen’s mantra and trademark, and the organization has fought to control this phrase as part of its brand. But cure and research go hand in hand. In my mind, Komen needs to step up to the plate. It needs to shift focus. It needs to rearrange dollar allotments and spend less time marketing itself. Komen must do better. Komen must be accountable, and not only to its corporate partners. Why? Because Komen can attract 55,000 walkers on a Sunday morning in May. Komen is the juggernaut of breast cancer fund raising. Komen’s position in breast cancer advocacy and success in galvanizing public support requires them to do more, especially for research. Though I am uncomfortable about the Komen organization’s approach to breast cancer, I am grateful to those 55,000 walkers who came out on Mother’s Day. They care. They should feel good about their intentions and efforts. They wanted to make a difference and in some way they did. But they, as well as the rest of us, all have the potential to do more. Did you know that May is National Cancer Research Month? I didn’t realize it until I accidentally stumbled upon it. Why doesn’t this designation receive any attention? Perhaps because doing so might benefit other cancers that don’t have media-covered races. Think of the possibilities if 55,000 walkers at such events (along with the rest of us) looked deeper, asked more questions, demanded more answers, considered other options, stopped assuming, and expected more. Everyone would benefit. We might ultimately find that elusive cure we say we are racing for. One last thought on the “Race for the Cure” — to race means to hurry in competition in order to complete or finish something; to cure means to restore to health or wellness, or get rid of an illness or disease. I have to ask: Are we really racing for a cure? And if so, what’s taking so long to cross that finish line, and why aren’t we in more of a hurry to do so? By definition, can we really keep calling this a race for the cure? This is a great post that will encourage people to look deeper. Raising awareness is a good thing, but we can always do more. A huge organization like Komen has the potential to do much more, but so does each individual person. Sometimes it’s easy to sit back and let these larger organizations handle everything. It’s easy to assume Komen is doing everything right and that it has all the answers. It doesn’t. It’s up to individuals to, as you said, ask more questions and demand more. Nancy is very brave to question such a huge organization! All her points are so important! I didn’t know that so little of the money raised actually went to research. Why so little? Is research a bad word? All the diseases that now have been eliminated because of research and their resulting vaccinations for young children should tell you something! When I was 5 years old (in 1947), I contracted what was then called ‘hard measles’. I spent hours throwing up, until I was throwing up a black tarry substance I can still taste today! It was blood from my stomach from the severe retching I was doing. My temperature reached 106, and I became delirious. My parents frantically called the local doctor who came to the house. He advised my parents to put me in a tub of cool water to get my temperature down. Then he told my parents, “If Sharon survives this, she will be brain damaged.” My father liked to remind me of this every time I brought home a school report card with all ‘A’s’ on it! Today, thanks to research, every small child is vaccinated for that nasty form of measles! Yes, because of RESEARCH!!! Today you don’t hear about children dying of measles in this country, thanks to the men and women who studied the virus and came up with a vaccination that prevented it. Let’s hope and pray that some day SOON there will be enough research done so that NO WOMAN ever has to suffer from breast cancer and all the repercussions of this deadly disease. It’s time to save the lives of the mothers, daughters, grandmothers, and nieces of this country! Wouldn’t it be nice if every young female child could just have a vaccination against cancer as they do now for measles, mumps, rubella? Think about it!!! And say a prayer while you’re at it! Nancy-Great post. My wife died last summer after a nearly 5 year battle with breast cancer. The issues you raise and Gayle raises in her book really need to be addressed by the mainstream cancer groups and that agenda needs to be set by the masses. We are doing it its not easy we need help but dont.give up google dr vince touhey hes going to.change the.face of breast cancer. Tuey’s research is an autoimmune-mediated strategy. Here is a link to one of his articles about it.